metal-form design that is both extremely comfortable and strikingly handsome. The durability and modular configurations of these steel park benches can provide endless seating capacity. Simply add sections onto either side of the park benches as your needs increase. 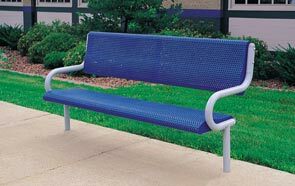 These thermoplastic park benches are available as portable benches or as an in-ground mount. An optional anchor kit is available which can easily transform the portable model park bench into a heavy duty surface mount. 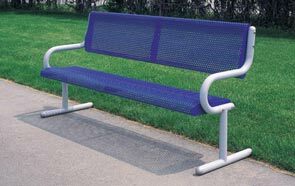 Increase the seating capacity and save money by purchasing an add on section to create a row of connected park benches that easily connect to share a common bench end.